In the 1970's we came dangerously close to losing forever one of the world most magnificent creatures. 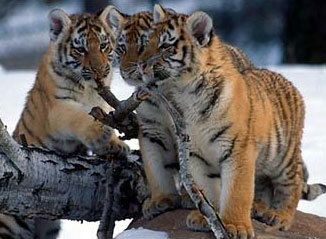 Poaching, deforestation, and human expansion brought all species of tiger to the brink of extinction. Indeed, over the past century, 3 of the 8 sub-species that existed became extinct; the Caspian, Javan and Balinese tigers. Today, we are by no means out of the woods. 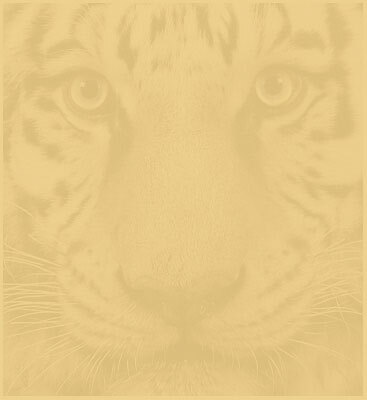 All remaining sub-species of tiger are endangered, making the tiger species as a whole nearly extinct. Figure 2 shows how the range of tigers has changed over the past 100 years. Once ranging all throughout India, southeast Asia, central Asia, and eastern China, only small pockets of natural habitat remain(3). 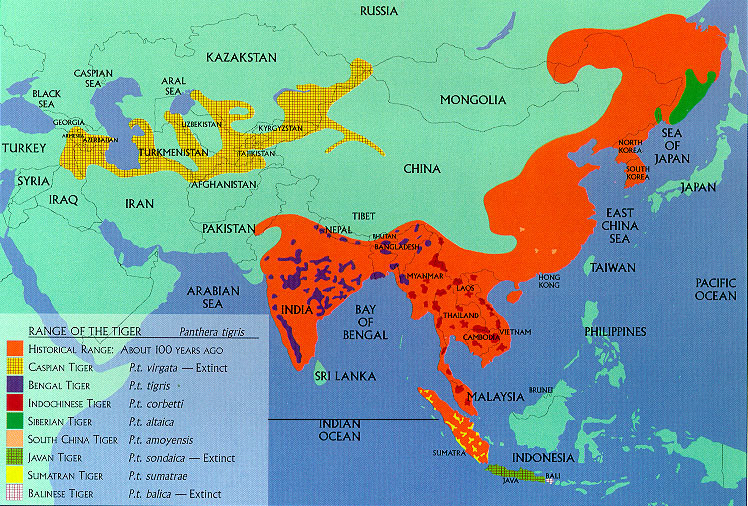 As Figure 1 shows, the tiger population dropped over the past 100 years by a factor of 25 - from an estimated 100,000 in 1900 to only 4000 in the 1970's. A concerted effort by wildlife protection groups in the 1970's halted their rapid demise and the global population of tigers in the wild has grown modestly to around 6000 at the turn of the century(1). Poaching continues to this day, however. When a Russian poacher can make as much from a single tiger kill as he would normally earn in 6 years, it will take more than words to halt this tragedy(2). 1. Aid and Assistance - See this section for ideas on how you can help the cause. 2. Education - Learn more about the problem and about tigers in general. 3. Fun Stuff/Appreciation - Appreciating tigers via pictures, sounds, drawings, and trivia.